In a sense, there are two Floridas: the north with hills, forests, lakes, and rivers; and peninsula Florida with flat expanses and large wetlands . Underlying the state is a system of aquifers . These natural storage facilities supply 90 percent of the state's drinking water and half its agricultural needs. The northern portion of the peninsula is dotted with the largest collection of springs in the United States. The south is dependent on rainfall to feed the wetlands and to refresh surface-water and groundwater reservoirs. Florida's water management issues differ from those of other states. Where development is usually driven by the search for scarce water resources, South Florida's development depends on draining an overabundance of surface water. To drain and manage the excess water, hundreds of miles of canals, dikes , and levees have been built. This flood-control and drainage system has destroyed thousands of acres of wetlands, fish and bird hatcheries, waterways, and even the soil itself. Water management policies have created agricultural, tourism, and real estate industries whose success has fueled the state's population growth and taxed the seemingly abundant water supply. Now choices must be made between further population growth, environmental protection, and an adequate, safe water supply. 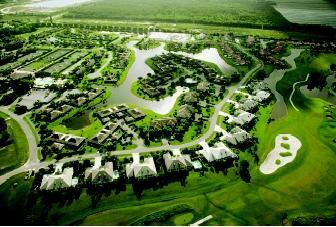 A housing development in a developed part of the Everglades surrounds a water runoff pond. Such drainage features are required by Florida law in order to reduce pollution levels in the Everglades. from populated areas for flood control. To meet the demands of a rapidly growing population, excess water must be stored for use during the dry season; however, that same population needs dry land for development. North Florida has experienced less population pressure, whereas South Florida's water resources are strained by the quantity and distribution of residents. Peninsula Florida's heavily populated coastal areas demand flood control but leave little land for water storage. The interior is largely agricultural with additional water demands. South Florida's problems are intensified by the lack of surface water flow from the north and the interruption of the Kissimmee–Okeechobee–Everglades watershed by canals and roadways. Starting in the mid-1800s, Florida's wetlands were drained. Disasters in the 1920s brought the demand for flood control. Flooding in 1947 pushed the U.S. Army Corps of Engineers to create the Central and Southern Florida Project, a complete flood-control system. The 1972 Florida Water Resources Act created five water management districts (WMDs) with territories defined by watersheds rather than political boundaries. The WMDs are responsible for water supply, flood protection, water quality, and natural systems. Consumptive use permits are required for those wishing to use water. Each district develops a district water management plan that defines the district's role in water resource management and provides comprehensive long-term direction. To guide the development of the plan, districts must establish minimum flows for surface waters and minimum levels for surface waters and groundwaters. Water-supply plans are developed by integrating county water plans and linking land use and water management. Land use is recognized as a critical water management component to protect all water resources. Districts prepare 5-year land acquisition plans and must maintain lands in an environmentally acceptable manner, restore and protect their natural state and condition, and allow public recreation when appropriate. In 1972, the state of Florida created five water management districts. These districts are designed to manage and protect water resources by balancing and improving water quality, flood control, natural systems, and water supply, as well as environmental protection. Water management districts in peninsular Florida are addressing the issues of river, lake and wetland restoration, water conservation and reuse, salt-water intrusion, and water resource planning and implementation. The districts in northern Florida assist rural communities with improvements in stormwater, wastewater, and drinking-water systems; stimulate economic growth by developing greenways, trails, and other ecotourism opportunities; and work with bordering states and the federal government to manage interstate water resources. The water management districts use various legal and administrative tools to deal with their issues. Water use caution areas may be designated where water resources may become critical in the next 20 years. This allows permitted quantities of water consumed to be gradually reduced. Water budgets are prepared comparing 20-year demand projections and the availability of known water sources. If water sources and conservation efforts will not meet future needs, a regional water-supply plan that investigates water resources and potential supplies is developed. The Surface-Water Improvement and Management Program identifies waterbodies in need of restoration or protection and assesses water quality, water quantity, habitat , and overall management of the system. The Save Our Rivers and the Florida Forever programs fund much of the districts' land acquisition. The Florida Department of Environmental Protection is responsible for protecting the quality of Florida's drinking water, rivers, lakes, and wetlands. The department establishes the technical basis for setting the state's water quality standards and conducts monitoring programs. Water management in Florida means dealing with extremes: flooding versus drought, and open land versus crowded cities. Population pressures and land development have stressed water supplies. Florida's system of water management districts provides regional leadership that plans for the future while ensuring fair treatment of water users and natural systems, flood protection, and adequate water supplies today. SEE ALSO California, Water Management in ; Coastal Waters Management ; Everglades ; Land-Use Planning . Blake, Nelson M. Land into Water—Water into Land. Tallahassee: University Presses of Florida, 1980. Carter, Luther J. The Florida Experience: Land and Water Policy in a Growth State. Baltimore, MD: The Johns Hopkins University Press, 1974. Livingston, Robert J., ed. The Rivers of Florida. New York: Springer-Verlag, 1991. McPherson, Benjamin F., and Robert Halley. The South Florida Environment: A Region Under Stress. U.S. Geological Survey Circular 1134 (1996). 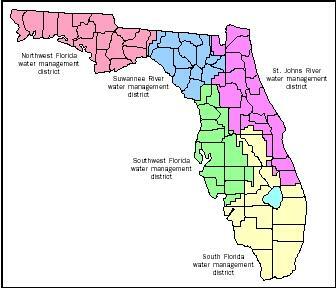 Florida's Five Water Management Districts. South Florida Water Management District. <http://www.sfwmd.gov/histo/3_5wmd_map.html> . Because coasts and other water-front property are very popular residential and tourist locations, urbanization and development place significant pressures on them. Their development stresses water regimes and displaces wild-life habitat. Between 1960 and 2010, the population-to-shoreline mile ratio in the southeastern United States is expected to triple.